If you were ever hoping to get a glimpse into the hearts of Catholic teenagers, it was right there on display on a signboard at the Indiana Catholic Youth Conference (ICYC) on Nov. 6. While those answers provide a sense of joy and promise concerning the lives and faith of Catholic youths, the conference’s keynote speaker strived to share a message of hope for teenagers who sometimes have to face life at its worst. “I know some of you here are feeling real suffering,” said Emily Wilson, a Catholic musician and speaker from California who travels around the world sharing her faith witness. Wilson then shared a defining struggle from her life. To help her through that difficult time, Wilson said she relied upon the example of a woman in the Bible who was suffering great pain, a woman who reached out to touch Christ’s garments, believing that effort would heal her. “In the middle of my suffering, in the middle of my pain, I reached out as this woman did to God. I didn’t understand why my mom had to suffer with cancer, but what I did know as a young person of faith was that God wanted to walk with me through it. Wilson’s talk—her second of the day—led to two of the most spiritually meaningful parts of the conference, eucharistic adoration and Mass. The youths’ deep reverence during adoration and Mass was as uplifting as the giddy jubilation they showed while responding to the antics of the musical group Popple earlier in the day. Conference activities also included playing games, taking part in the sacrament of reconciliation, running through inflatable challenges, and checking different displays about vocations, the pro-life movement and care for creation. 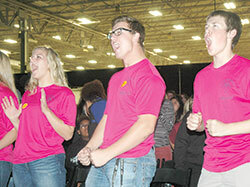 The conference attracted youths from 65 parishes, including two from the Lafayette Diocese. Reid Carter made that closer step to God during the conference by taking advantage of the opportunity for the sacrament of reconciliation. “I realized there was some stuff I had done that I needed to get off my chest to be a better person,” said Reid, 18, one of nine youths from Holy Family Parish in New Albany at the conference. “I just wanted to talk to someone about it. The teenagers’ reactions matched the hopes of the coordinator of the youth conference. “We strive to create an environment where the ‘young Church’ can have fun, interact, pray and dig deeper into their relationships with their peers and their youth leaders,” said Scott Williams, coordinator of youth ministry for the archdiocese. In his six years in youth ministry, Williams has learned that young people thirst for close connections, including with Christ. The youth conference enhanced those relationships, Williams said.